The traditional ORMED profile is the combination of experimental and clinical research in oral health. Organization and supervision of randomized clinically controlled studies (RCT). GCP conform study design including application for ethical approval, selection of study sight, calibration of investigators and study nurses, biostatistics. 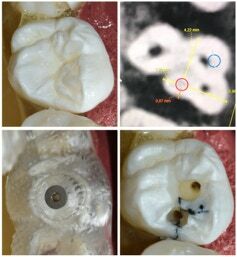 Clinically validated robot testing of plaque removal efficacy by manual and powered toothbrushes, computer-assisted plaque planimetry of 24 coronal fields and 6 root fields at four sites per tooth, including all tooth groups in the deciduous dentition, in mixed dentition and in the permanent dentition (see Publications). Plaque is simulated either with our unique organic and anorganic plaque simulation giving superior discrimination of plaque removal efficacy for all different oral hygiene devices. Development of oral hygiene products and experimental laboratory testing followed by clinical studies. Comparison of low abrasive gels with oral hygiene tablets and abrasive dentifrices. The aim of gel application is prolonged bioavailability in the oral cavity in dry mouth conditions, nursing conditions and post operative rehabilitation. 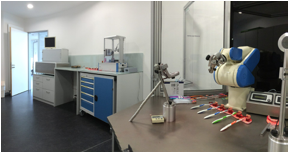 Ergonomics in dental operating microscopy, individual adaptation of ergonomic position of the operator, individualization of configuration of microscopes, clinical support for the development and improvement of operating microscopes. 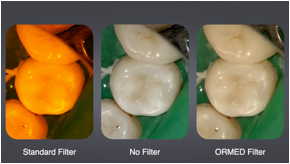 ORMED invented a novel filter to enhance the light conditions while working with light-cure dental materials. Click on the image to see the introduction video. This technology was implemented into the Carl Zeiss EXTARO 300 microscope. Click on the publication area to get more details about this technology. Methodological development and experimental testing of guided endodontic treatment support by using combined 3D imaging and computer aided guidance followed by clinical testing. ORMED invented an Adaptive Spray preparation technology enabling optimal vision with no change of modes and instruments, in wet and dry condition. Click here to find out more.